Kigali has been the economic, cultural, and transport hub of Rwanda. 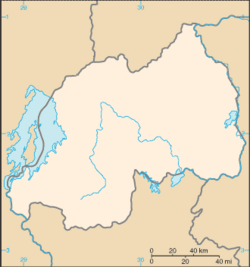 The city became Rwanda's capital in 1962 when independence was gained. The city is located on the Rugwana River in the nation's geographical center. The settlement began as a small colonial outpost and functioned as a trade center during the German colonial administration (after 1895). It was chartered as a city in 1907, becoming a regional center during the Belgian colonial period of 1919–1962. When Rwanda gained independence in 1962 Kigali was selected as capital city, due mainly to its central location. Its estimated population in 2008 was approximately 900,000. Kigali was one location of the Rwandan genocide, in 1994, and of fierce fighting between the army (mostly Hutu) and the Tutsi dominated Rwanda Patriotic Front. Following, the government made efforts to bring the people together. Rwanda faces multitude and numerous difficulties. Today Kigali is safer, cleaner, and more competitive; a modern city with expanding opportunity. In the early twenty-first century, the city boasted a "Master Plan" for governance in line with Vision 2020 of Rwanda, based upon research and analysis of a wide range of background conditions and technical aspects. Environmental conditions, land use, and infrastructural, cultural, and socioeconomic factors, along with economic and demographic projections, were analyzed as economics and urban development plans were enacted. The name "Kigali" comprises the Bantu prefix "ki" and Rwanda "gali" meaning "broad." The city takes it's name from Mount Kigali. The city is built in hilly country, sprawling across about four ridges and the valleys in between, on the Ruganwa River. The tops of the ridges have an average elevation of 5,246 feet (1,600 meters) while the valleys are around 4,270 feet (1,300 meters). The city is almost ringed by higher hills, the highest of which is Mount Kigali, with an elevation of 6,075 feet (1,850 meters) above sea level. Because of the high altitude, Kigali has a pleasant tropical highland climate. Temperatures range from 68°F (20°C) to 71°F (21.6°C) year round. There are four seasons: Long rains from mid-March to mid-May, short rains from mid-October to mid-December; a long dry period from mid-May to mid-October; and a short dry season from mid-December to mid-March. Average annual precipitation is 35 inches (900mm). 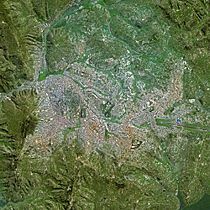 The city center is located on one of the city's four ridges, with the main government area on another. There is a Muslim quarter, to the northeast is a squatters’ settlement, and southeast is an industrial area. The larger houses and office buildings tend to be on the tops of the ridges, while the poorer people live in the valleys. Juvénal Habyarimana during a visit to the United States, 1980. Habyarimana was killed in 1994 when his plane was shot down while landing in Kigali. The Twa, the aboriginal Pygmy inhabitants, a group of diminutive forest hunters and gatherers, have probably lived in the Rwanda region possibly as far back as 30,000 B.C.E. By the fifteenth century the Hutu and Tutsi had moved in. The Hutus primarily were farmers who lived on hilltops, and the Tutsi were warriors and herders who lived on the hillsides and in the valleys. In the nineteenth century, a feudal-type system evolved, with sharp social divisions in which Tutsis dominated. In 1895, the Rwandan king accepted German rule to maintain his power, and the area became part of German East Africa. The Germans did nothing to develop the country economically, and retained the indigenous administration system under indirect rule similar to that established by the British Empire in the Ugandan kingdoms. The city of Kigali was founded in 1907 under German colonial rule, and functioned as a trade center. After Germany's loss in World War I (1914-1918), Belgium took over Rwanda with a League of Nations mandate. Belgian rule was far more direct and harsh than German rule, and favored the minority Tutsi upper class. At that time, Kigali became a regional center. After World War II (1939-1945), Rwanda became a United Nations (UN) trust territory administered by Belgium. In 1959, King Mutara III Charles was assassinated and his younger brother became the Abega clan monarch, King Kigeli V. In 1961, Dominique Mbonyumutwa, with the support of the Belgian government, led a coup d'état, overthrowing King Kigeli V.
Upon Rwanda's independence on July 1, 1962, Kigali was chosen as capital because of its central location, over the traditional capital in Nyanza, which was the seat of the mwami (king), and Butare, then known as Astrida, the colonial seat of power. Gregoire Kayibanda (1924-1976) was the first president from 1962 to 1973, followed by Juvenal Habyarimana, from 1973 to 1994. The latter, regarded as a ruthless dictator, was unable to solve increasing social unrest, calls for democracy, and the long-running problem of Rwandan Tutsi refugees. By the 1990s, Rwanda had up to one million refugees scattered around neighboring countries, mostly in Uganda and Burundi. In 1990, the Tutsi-dominated Rwandan Patriotic Front invaded Rwanda from Uganda. During the fighting, top Rwandan government officials, mainly Hutu, began secretly training young men into informal armed bands called Interahamwe (a Kinyarwanda term roughly meaning "those who fight together"). Government officials launched a radio station that began anti-Tutsi propaganda. The military government of Habyarimana responded to the Rwandan Patriotic Front invasion with pogroms against Tutsis, whom it claimed were trying to re-enslave the Hutus. In August 1993, a cease-fire agreement known as the Arusha Accords was signed in Arusha, Tanzania, to form a power-sharing government, but fighting continued. An underfunded and understaffed peacekeeping force known as the United Nations Assistance Mission for Rwanda was sent. 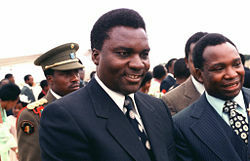 On April 6, 1994, President Habyarimana was killed when his airplane was shot down while landing in Kigali. Over the next three months, with help from France, the military and Interahamwe militia groups killed up to one million Tutsis and Hutu moderates in the Rwandan genocide. Kigali was the scene of the genocide, and of fierce fighting between the army (mostly Hutu) and Tutsi-dominated Rwandese Patriotic Front. In 2004, a ceremony was held in Kigali at the Gisozi Memorial to commemorate the tenth anniversary of the genocide. The country observes a national day of mourning each year on the seventh day of April. 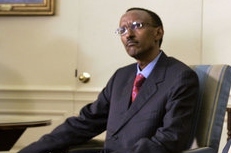 President Paul Kagame in 2007. Rwanda is a presidential republic in which the chief of state is the president, elected by popular vote for a seven-year term, and is eligible for a second term, and the head of government is the prime minister. The bicameral parliament consists of a senate of 26 members, both elected and appointed to serve eight-year terms, and a chamber of deputies of 80 seats, including 53 members elected by popular vote, 24 women elected by local bodies, and three selected by youth and disability organizations, all to serve five-year terms. Kigali is a province-level city governed by a city council who appoints an executive committee to run the day-to-day operations of the city. The executive committee consists of a mayor and two deputies. 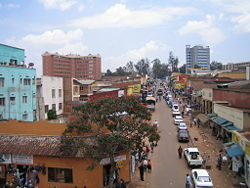 The city is split into three administrative districts called sectors: Gasabo, Kicukiro, and Nyarugenge. 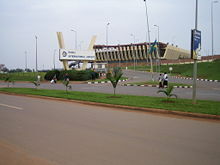 The city is coterminous with the province of Kigali City, which was enlarged in January 2006 as part of local government reorganization in the country. The city's urban area covers about 70 percent of the municipal boundaries. The main home and offices of the Rwandan president are located in the city, as are the government ministries. Rwanda is a poor rural country with about 90 percent of the population engaged in (mainly subsistence) agriculture. It is the most densely populated country in Africa and is landlocked with few natural resources and minimal industry. Primary foreign exchange earners are coffee and tea. The 1994 genocide decimated Rwanda's fragile economic base, severely impoverished the population, particularly women, and eroded the country's ability to attract private and external investment. However, Rwanda has made substantial progress in stabilizing and rehabilitating its economy to pre-1994 levels, although poverty levels were higher in 2008. Per capita GDP was estimated at $800 in 2007. Tin ore (cassiterite) is mined nearby, and the city built a smelting plant in the 1980s. Business in Rwanda is growing, and many new buildings are emerging across the city, including the BCDI tower and the Centenary House office block. Tourism and expatriate NGO workers provide important input into the economy as well. Kigali is the hub of the Rwanda transport network, with hourly express bus routes to all major towns in the country. There are also taxi minibus services (matatus) leaving from Kigali for the major towns. 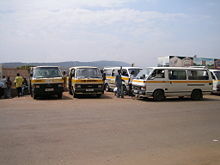 Public transport within Kigali is exclusively by taxi minibus. There are also motorbike taxis ('taxi moto'). Kigali International Airport has passenger connections daily to Nairobi and less frequently to Addis Ababa, Brussels, Bujumbura and Johannesburg. There are also weekly cargo flights to Amsterdam. The population of Kigali was 965,398 in 2009. Hutu (Bantu) make up 84 percent of Rwanda's population, Tutsi (Hamitic) 15 percent, and Twa (Pygmy) one percent. Official languages include Kinyarwanda universal Bantu vernacular, French, and English English, while Kiswahili (Swahili) is used in commercial centers. Roman Catholics made up 56.5 percent of Rwanda's population in 2001, Protestants 26 percent, Adventists 11.1 percent, and Muslims 4.6 percent, Those following indigenous beliefs made up 0.1 percent, and those with no religion 1.7 percent. The Kigali Institute of Science, Technology and Management, in Kigali, is the first technology-focused institution of higher education to be created by the Rwanda government. 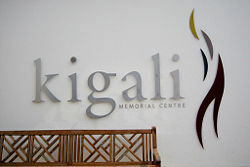 Entrance to the Kigali Memorial Centre. The Kigali Genocide Memorial Center, opened in April 2004, commemorates the Rwandan genocide of 1994. The Aegis Trust, the United Kingdom-based genocide prevention organization, was invited to establish the Kigali Memorial Center in partnership with the Kigali City Council. The memorial is on the site where up to 250,000 genocide victims were buried in mass graves. The center is the hub of the Aegis Trust’s work in Rwanda. Audiovisual and GPS documentation projects are in progress, recording and substantiating survivor testimony and recording the Gacaca trial process. The Mille Collines in the Kiyovu area. 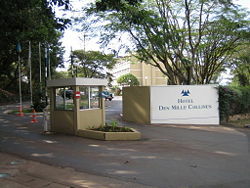 This hotel became a refugee center during the genocide, as famously depicted in the film Hotel Rwanda. It is also the setting for the famous novel Un dimanche à la piscine à Kigali, by Quebecer Gil Courtemanche, and its movie adaptation Un dimanche à Kigali. The Novotel Umubano in the Kacyiru area. This was formerly a Le Meridien hotel, then known as Le Meridien Umubano. It was bought by Novotel after the genocide. The Kigali Serena Hotel, formerly a Belgian-owned hotel, known then as Diplomates, this splendid and original Hotel was also—albeit briefly—portrayed in the second half of Hotel Rwanda. The city hosts a We Are The Future center, a child care center managed under the direction of the mayor’s office, and the international NGO Glocal Forum. Launched in 2004, the program is the result of a partnership between the Glocal Forum, the Quincy Jones Listen Up Foundation, and Hani Masri, with the support of the World Bank, United Nations agencies, and major companies. The organization’s main goal is to mobilize global resources for the benefit of children in post-conflict cities through the creation of municipally-owned child centers that focus on youth-led activities in the five areas of nutrition, information and communication technology (ICT), health, sports and arts. Rwanda struggled to boost investment and agricultural output following a devastating war. Ethnic reconciliation was complicated by the real and perceived issues Tutsi political dominance by the Hutu minority. Kigali's increasing centralization and intolerance of dissent, the nagging Hutu extremist insurgency across the border, and Rwandan involvement in two wars in the neighboring Democratic Republic of Congo hinder Rwanda's efforts to escape its recent legacy. World Factbook. Rwanda Retrieved September 14, 2016. This page was last modified on 17 April 2018, at 14:26.